Hubs leaves for the west side of the state for the week. He’s bringing his long johns since it is a bit colder than it is here. While its about 19 degrees here today, it’s going to be 60 degrees in South Carolina. I don’t mind season changes as I had said before. I enjoy fall, spring, and summer. I can do without winter. Don’t tell me the benefits of winter. I don’t mind winter as long as it is short and sweet. Like about a month long. We only get about three inches of snow and that’s it. We’ve had snow since November. It is now February. It looks like it is here to stay through March. That is too long. I’ve been working on my hubs to have us move down south or out west for nearly as long as we have been married. I think I’m getting him warmed to the idea – finally. Every winter, I ask, why am I here? Then when the temperatures start to hit above 70, I am happy and winter is long forgotten. 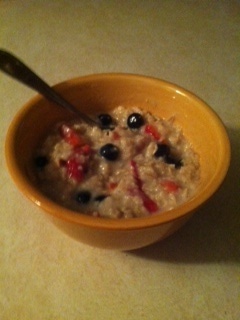 Anyways, I’m enjoying my breakfast of oatmeal with fresh fruit mix of blueberries and chopped strawberries. I sweeten it with agave and almond milk. Yum. Spent all day grading yesterday – it took me eight hours to grade 42 papers. I was holed up in my upstairs studio/office most of the day, taking breaks to have lunch and dinner. I ran out to get prescriptions and makings for homemade vanilla ice cream. Then when I was done, I went to bed to read. Today its half day at the chamber and then I need to work on my homework, prep for Friday’s class and hopefully get started on our taxes. Maybe I’ll get a chance to go downstairs too.